January 15, 2014, Cayuga County, NY – The Haunted History Trail spear-headed by the Genesee County Chamber of Commerce in 2013 was developed to leverage growing interest in “paranormal tourism” and promote the hauntings and ghostly events happening in Genesee County and twelve other counties in new York State. The Trail proved so popular that now twenty-one counties have joined the Trail and Cayuga County is one of them. Paranormal Tourism has become an enjoyable hobby for many people around the world. There are haunted hotels, bed and breakfasts, historical sites, cemeteries and special events that attract paranormal -curious visitors and more are expected to be developed as demand increases. The Haunted History Trail leads people to some of the State’s most popular haunted venues, ghostly graveyards and spooky events. 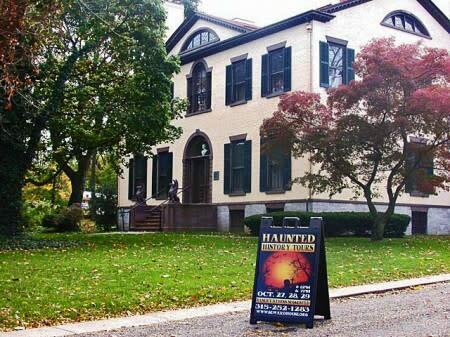 From the Haunted Fortress at Old Fort Niagara to the friendly spirits that appear at The Naples Hotel to ‘Zombie Land’ in Candor, the Trail has every eerie source of entertainment you can think of. The Haunted History Trail offers serious ghost hunting as well as seasonal ghostly-themed events that cater to every degree of interest and bravery! In Cayuga County, you can walk the gangplank on Captain Jack’s Haunted Pirate Ship, experience a nerve shattering mix of evil characters at Screamer’s Hollow, walk among famous spirits at Fort Hill Cemetery and hear tales of the supernatural on the Seward House Museum’s Haunted History Tours.